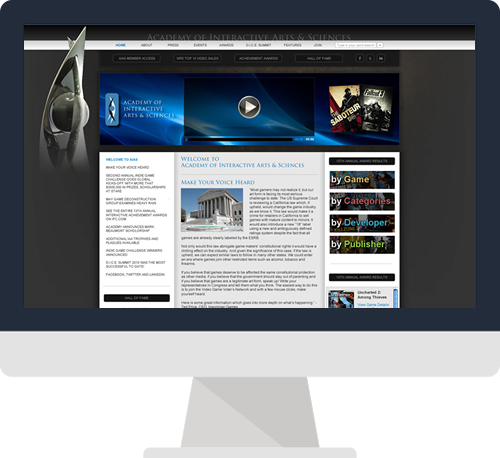 Los Angeles Responsive Website Design | AIAS new web designs. The Academy of Interactive Arts & Sciences (AIAS) was founded in 1996 as a not-for-profit organization dedicated to the advancement and recognition of the interactive arts. The mission of the AIAS is to promote and advance the worldwide interactive entertainment community; recognize outstanding achievements in the interactive arts and sciences; and host an annual awards show, the D.I.C.E. Awards, to enhance awareness of the interactive art form. The latest redesign of the AIAS website focused on achieving the goals of simplifying their extensive data and displaying the video game artwork in a more visually dynamic and integrative way. We created vivid imagery with artwork tiles to showcase the award nominees and winners with the ability to view more detailed information with an interactive tab display feature for viewing the awards by either Game, Category, Developer or Publisher. 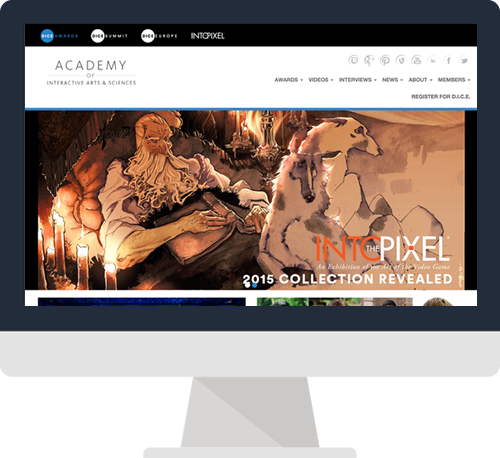 The Academy's websites have a cohesive look utilizing the graphic tiles for new and key info on their homepage. A shift in end user device usage facilitated the Academy's move to a responsive design that could be used on tablets, phones and more. A flexible grid was built on the well-rounded Bootstrap framework in order to support the new image tile layout implemented across three sites. The T2 CMS that provides AIAS the ability to take control of their sites and manage their content and awards was customized to manage 30,000+ memberships and includes an archival system for all their past awards for Game Nominees, Winners, Developers, and Publishers. Thinking2 created a relational database that could support all of the commonalities between the games, the award types, developers, and publishers that would bring the design and database into a cohesive environment.